Asparagus is a delicacy that adds elegance and a distinct flavour to a wide variety of dishes. Most of us know British asparagus to be green but there is a fruitier purple variety, while on the continent the preference is for white asparagus, which has a milder taste. British asparagus has a reputation for being the best – it’s tender and sweet. Asparagus is difficult to grow, found in season for only a few months – between April-June. If you’re a forager, wild asparagus can be sourced from by the coast of some counties such as Cornwall, Dorset and Pembrokeshire. It’s skinnier and carries a more intense flavour. When sourcing, avoid limp shoots and opt for firm, straight stems with snugly furled spears. Try and buy stalks that are equally thick, too, to ensure even cooking. Store wrapped in damp kitchen paper in a plastic bag, or in a glass of water, and use within 2-3 days. When cooking asparagus spears, discard the thick, tough, woody stems. You can do this by bending the spears which will naturally snap at the right point. Some cooks peel stems and even the spears; if you do peel, cook immediately to avoid the flesh discolouring. Asparagus only needs a short cooking time and the quicker it’s cooked the better, in order to preserve nutrients. It’s usually blanched for a brief period of time in salted boiling waterfor about 2-3 minutes. If you like a bit of colour on the asparagus, grilling, griddling, barbecuing or roasting are all great examples of how to cook asparagus. 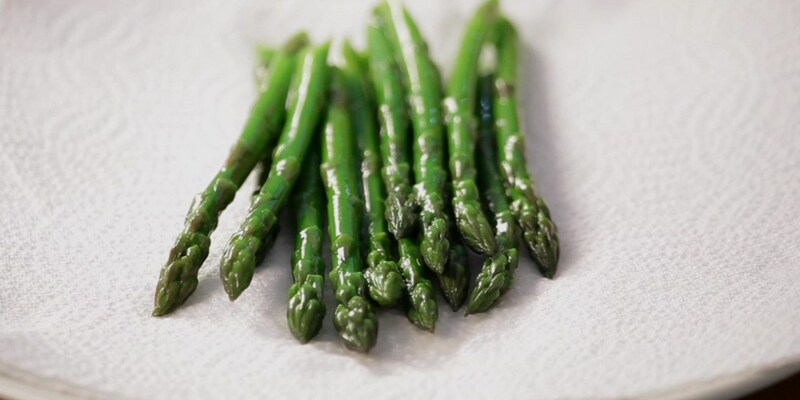 Brushing with olive oil before cooking will ensure the asparagus does not dry out. To determine if asparagus is cooked, test the tips with a sharp knife: you’re aiming for tender tips with al dente stems - asparagus benefits from a bit of crunch. Cooking asparagus sous vide locks in flavour that would normally be lost when boiling in water. It also allows for precise cooking and the slightly lower temperature prevents the cells of the vegetables from breaking down too much, keeping the asparagus crisp. Asparagus is a versatile vegetable that makes a healthy snack with a dollop of something creamy. It’s a noteworthy ingredient in starters and a strong main course accompaniment. It pairs well with egg-based sauces such as hollandaise, sharp cheeses (Parmesan or Pecorino are perfect) and fish. It’s ideal in a spring risotto, in fresh pasta dishes and quiches. It also pairs gloriously with truffle.